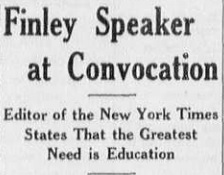 Article "Finley Speaker at Convocation"
This article discusses the speech that Dr. John H. Finley, editor of the New York Times delivered to various honorary fraternities the Honors Convocation on the University of Richmond's campus. 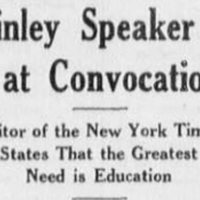 Dr. Finley, a previous Princeton professor, believed in the importance of education for livelihood. Finley spoke at Richmond’s Honors Convocation in honor of it being one year since the University’s centennial celebration. Many honorary fraternities, such as Phi Beta Kappa and Alpha Psi Omega, were in attendance for this convocation. In his speech, he talked about the relationship between education (vocation) and leisure (avocation), claiming that the education that a man cannot achieve during his job or occupation, he should strive to achieve during his leisure. He also discussed a concept called the "race mind" and how it "transcends individual and even national bounds and becomes a world affair" to make an educated man. “Article "Finley Speaker at Convocation",” Race & Racism at the University of Richmond, accessed April 18, 2019, https://memory.richmond.edu/items/show/488.